HAPPY PRAWNS SEEK HAPPY MONEY! PRAWNS. The company's formal name is Norsk Scampi AS. – You have an idea, you talk to someone who talks with someone, and all of a sudden it dawns on you that this may actually come to fruition. It SHALL come to fruition! We gather friends and people who can help build on our idea. People who know that it isn’t just absolutely possible, but once in a while necessary, to combine quality, sustainability and creativity to make an effort pay off. In the long term, our market is the world – in other words enormous and insatiable. For more than eight months, we have conducted pilot production of fresh king prawns – indoors, in a 12,000 liter tank filled with genuine Norwegian seawater. So far, results have been very promising. Our plan going forward, is to build a research facility for a complete production line of 80 tanks in all. Our goal is to produce around 100 tons by 2019. It is for this extended pilot phase that we now need Norwegian, preferably local, partners who are able to assist us with our plans, both professionally and financially. Do you want more info or think you can contribute to our journey? Contact Magnar Hansen at +47 466 55 759 or write to magnar@happyprawns.no. Consider these web pages an appetizer. 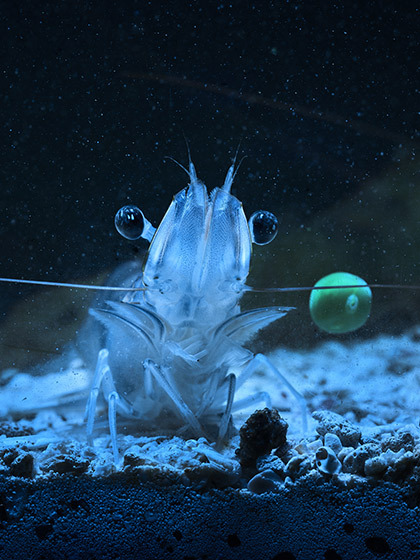 If you’re really hungry for info about HAPPY PRAWNS, we stand as ready as a freshly starched maître d’ to help you. All you need to do is to provide us with your e-mail address via the link below, and you’ll receive a newsletter once a month. Welcome! Oops! Something went wrong. Please check your e-mail address.